In this age of constant connectedness, we’ve all seen people buried in their phones texting or composing that next Tweet. It almost seems like people need to share with each other as much as they need food and water. While that sounds like a bad joke, it’s actually true. According to psychologists, every time we send a message or get a like on one of our posts, it triggers a dopamine release in our brain the same way eating or drinking does. Online sharing has become a powerful biological impulse. 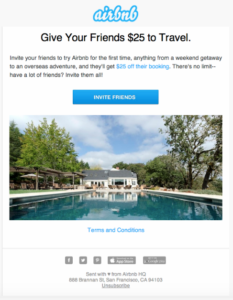 Your referral program can satisfy that impulse just as well as social media. A referral is part of the online conversation between friends, like a wall post or an @ mention. The only difference is that it is a recommendation of your product. It’s not just about getting new customers. It’s about social influence too. If your referral program fulfills your customers’ need to share, you have a unique chance to shape the way people talk about your brand. Let’s break down the three referral steps you need customers to complete and see how you can nurture the impulses that power each one. To get the referrals flowing, it’s not enough to just put your program on your site. You need to actively seek out the customers who are most likely to refer, hit them with special messaging around your program, and show them that sharing a referral isn’t just about getting a reward or helping your company—it’s also a way to deepen their connections with their friends. This is especially important when your referral program is first getting started. Your customers will share, need to share – you just have to make it possible. 1. Active customers share actively. No one will share a referral if they’re not already a huge fan of your product. See which customers have purchased the most or, if you have a loyalty program in place, check out your most active members. 2. Cross-section with your biggest sharers. 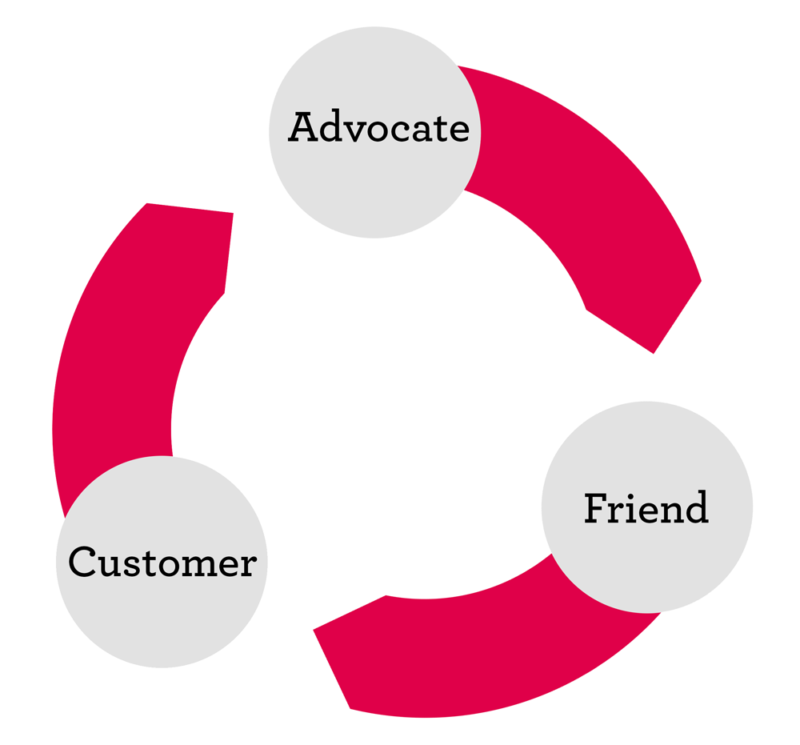 Next, find the overlap between those avid customers and the ones who are most active on social media, since that suggests they get joy out of sharing with friends. Your referral program software can pull in social media data for all your customers, so you can see which ones are most active online and have the widest reach. 3. Show those users how they can use referral to connect with friends. You’ve pinpointed the customers who love both your product and sharing cool stuff with their friends. Now, show them that your referral program is a chance to combine both. Target them with emails like Airbnb’s. By emphasizing the new customer’s reward, Airbnb positions the referral as an experience the advocate needs to share—something their friends will be excited about. These steps let you pinpoint your most likely advocates and position referral as an irresistible way to satisfy their sharing impulse. Texts and Facebook likes trigger powerful enough emotions to become addictive because they’re socially validating. They confirm that your friends like you and want to interact with you. Everyone feels a bit giddy when their phone vibrates—it’s a reminder that someone out there cares about them. You can evoke those same feelings with your referral messages. When someone looks at a referral message from one of your advocates, it should feel like a personal message that came from a friend so that they’re excited to respond. It shouldn’t look like a bland piece of marketing copy. Show them the advocate’s face. Every messaging app, from iMessage to Gmail to Facebook Messenger, includes a picture of the sender next to the message. Familiar faces jump out at recipients and get them excited to respond. The same thing holds true in referral messages—including the advocate’s face boosts conversions by 3%. Let advocates make recommendations. Recipients will feel a lot more excited when they see that their friend has taken the time to recommend an item just for them. For instance, bag retailer Kipling encourages advocates to direct their friends to a bag they think suits them when they share a referral. If you’re a software provider, you can try letting advocates recommend specific features or customizable options. Make converting seamless. No matter how excited your referral message gets new customers, it’s only temporary. Their motivation to buy will wear off if there’s friction between receiving the referral and making a purchase, so make sure that process takes as few clicks as possible. Following these tactics makes your referral messages as exciting as any message from a friend, which makes that excitement easy to act on. Your referred customers are more than 5x as likely to share their own referrals as the average customer. That’s why the referral flywheel effect is so powerful. It creates a positive feedback loop in which advocates are constantly referring new customers, who become advocates themselves, which leads to even more new customers. In order to get the full benefits of that flywheel, you need to go out of your way to further heighten the referral impulse in those newly-referred customers. The key is to reinforce what a great friend-to-friend experience they had when they were first referred, and show them how sharing a referral of their own is the best way to recreate that experience. Take advantage of first purchase excitement. For new customers, the most exciting part of accepting a referral is making that first purchase at a discount. That’s when the dopamine is really flowing. Take advantage of that magic moment by offering them an increased reward to share a referral on their favorite social media platform. That gives you the advantage of reaching the new customer’s entire network, instead of just a single friend. More frequent referral messaging. Consider this the low-hanging fruit. Referred customers are already pre-disposed to share a referral, so target them with extra referral messaging. They should get more emails promoting your referral program and see a message encouraging them to become an advocate every time they go to your site. Let them pay it forward. When someone feels they’ve benefited from another person doing them a favor, they want to do the same thing for someone else. Tap into that by reminding referred customers of the person who did them a favor by introducing them to your brand. Try putting a picture of the advocate who referred them into emails you send them promoting your referral program. The referral impulse is already strong in your referred customers, and these tactics ensure you capitalize on the opportunity. Referral marketing is the only marketing tactic that can so perfectly give today’s customers something they badly want—the ability to share awesome stuff with their friends. But that doesn’t just happen on its own. You need to be deliberate about how you help them scratch that itch at each stage of the referral journey. But if you can do that, your customers won’t be able to stop themselves from referring any more than they can stop themselves from checking Facebook every five minutes.